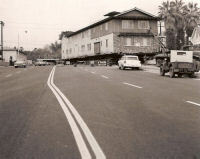 My first experience with foundation bolting and retrofitting was gained in March, 1958 when my dad and grandfather moved their 10 unit apartment building across Madison Street in Pasadena, turning it around 180 degrees and placing it on the north east corner of Madison and Cordova. The building remains at this location today. Today our foundation retrofitting and bolting begins with a Structural Engineer who after inspecting the site draws plans that are submitted to the local building department for approval. The plans specify the specific hardware, bolts, epoxy, concrete mix (usually at least 3000psi), etc. that we use. Examples of Foundation Wall & Tile Finishes at a Craftsman in North Monrovia circa 1906. The finishes in the photographs are the work of our full time mason who has been working for us since 1995. We try to match original materials as closely as possible. 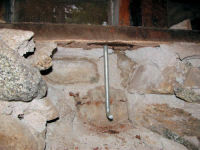 The fieldstone foundation wall shows the original wall built in 1906 to the right of the corner and to the left of the corner a manufactured rock fascia covering a concrete block foundation wall installed in 2005. If beautiful Kailua-Kona, Hawaii is the destination for you, then we have the home. This property boasts views right into Kailua Bay. Some of the features of this brand new home are: approximately 2,300 sq.ft. of living space with 3 bedrooms and 2.5 baths, 2 car garage, laundry room and plenty of storage under the house. The entryway is open to the second story with the rest of the downstairs having 9-foot ceilings. Upstairs ceilings are vaulted. In 1925 it was converted into three 2 bedroom, one bath units. At the time of the conversion the front porch was enclosed using very poor workmanship, used lumber, concrete, and metal sash windows. The property had been neglected for at least 50 years. When I looked at the city building permits the first one was from 1925 when the gas lighting system was removed and the house was wired for electricity. Since then not much else had been done except roofing and painting. 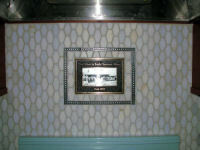 The bungalows were built by Sherman J. Mc Queen who named his project after President Harding who was inaugurated in 1921 the year construction began. The property had been severely neglected for at least 50 years. We acted as Brokers and sold this home to the current owner and acted as General Contractors for the renovation and master suite addition. The home had been in the same family for over 70 years and was extremely tired, dirty and outdated. It took 29 dump truck loads to clean out this house, garage and yard. The house was piled 3 to 4 feet high with belongings and had not been cleaned for many years. In a couple of photos you can see cobwebs full of thousands of dead flies. North Monrovia Craftsman and 4 Rental Units. Purchased in 1998 this single family craftsman home with four apartment units behind it was on the market for over six months due to the poor condition of the property. Once purchased we needed four 40 yard dumpsters just to clean up the property.